I’ve got a finish-finish from way back when. I gave myself a chocolate chip cookie. Mmmmmm. 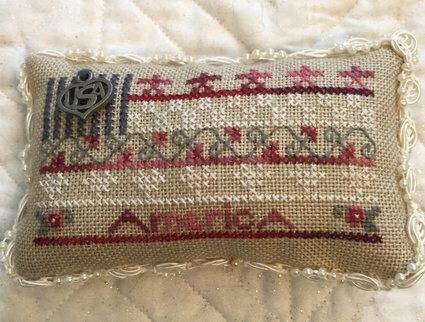 I’ve stitched a couple of flag-related smells recently. This is part of the Glory House kit by Chessie & Me. I didn’t stitch the lawn. 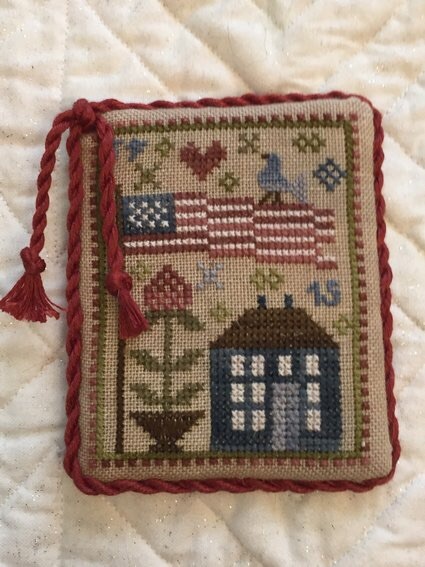 While I was finishing this, I thought it was a great size for a needlebook. Still love this the way it is. This is Tiny Flag kit by Shepherd’s Bush. It’s so cute. 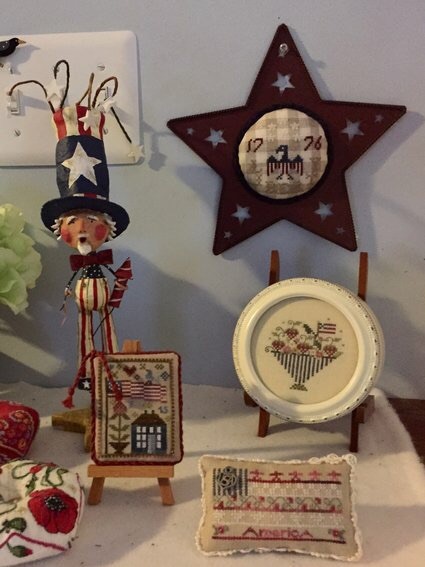 I set up a small patriotic display for Flag Day/summer. Here is my current progress on my sister’s Bargelo Symphony. I’m about halfway through part five, and still have so far to go. 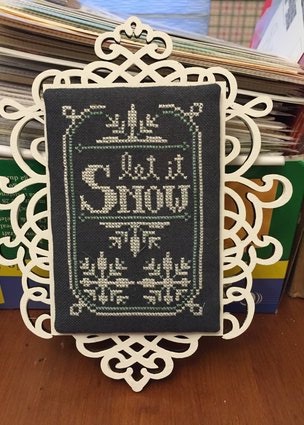 It’s the background stitch, the Victorian step stitch that’s the biggest part of what’s left. I had some anxiety about the colors of the step stitch. I tried another color combination, but instead of easing my anxiety, it gave me a stomachache. Nerves are a much more tolerable form of anxiety to manage than stomach pain. As long as my sister is satisfied, I can let my uncertainties pass. I’ve been keeping busy with small projects. 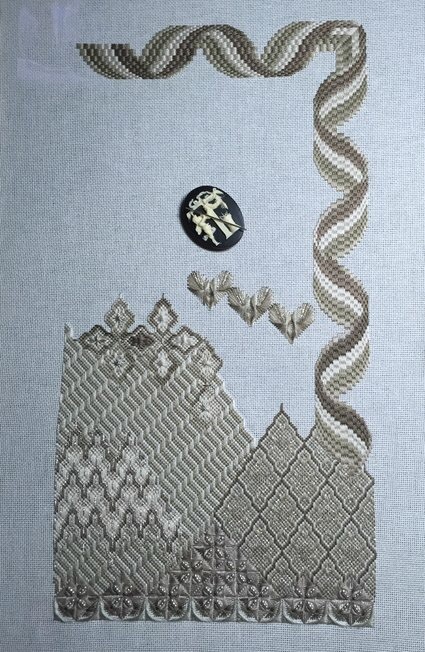 I had a crisis of indecision with the modified Bargello Symphony, so I’ve been distracting myself. I decided on a way to finish my Year in Chalk designs. I’m really pleased with the results. I found a lasercut plaque I liked and painted it white. I stuck a Pro MAG magnetic card to the front. I mounted the finished piece on a piece of comic book backing board and put another magnetic card on the back. It was tricky for me to get the piece to center on the plaque the way I wanted, so I added a few tiny rare earth magnets to the plaque’s magnetic card, et voila! A happy stitcher. I’d say luck was with me with this finish. I prefer the magnets to Velcro. 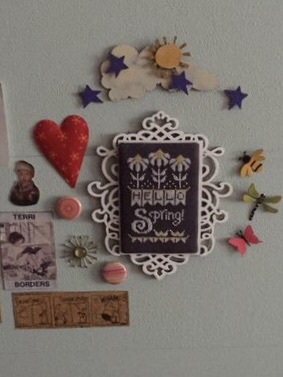 I also put a magnetic card on the back of the plaque so I could put it on my magnetic wall. The card wasn’t strong enough to hold the plaque and finished design, so I glued a few rare earth magnets to the card with much success. I had some fun with my magnets. What’s that, you say? Spring is almost over? I mentioned summer in my blog title? Memorial Day weekend is the traditional start of summer? All true. Here’s A Taste of Summer by Shepherd’s Bush. I didn’t stitch the words. I’ve completed half of the Book Riot Read Harder Challenge. I’m not reading them in any particular order, but I’ve listed them according to challenge number here. 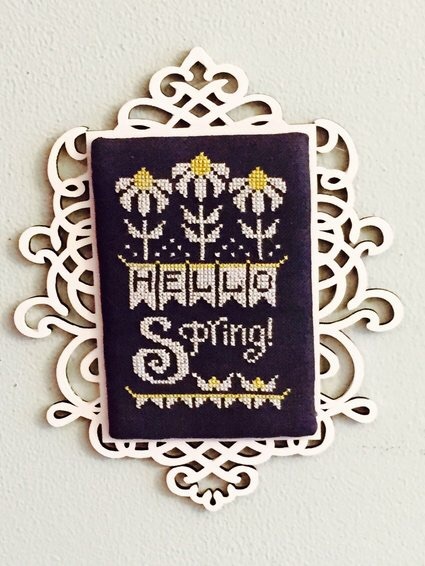 Another Year in Chalk design I needed to stitch. 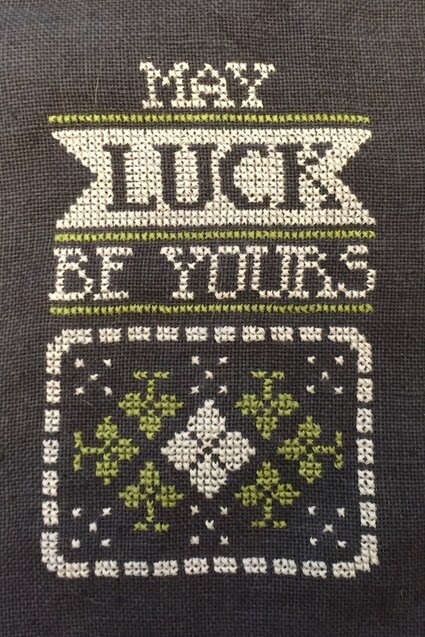 I stitched the clovers in green rather than the diamonds. Good thing, too. It used the full skein of chalk as is. 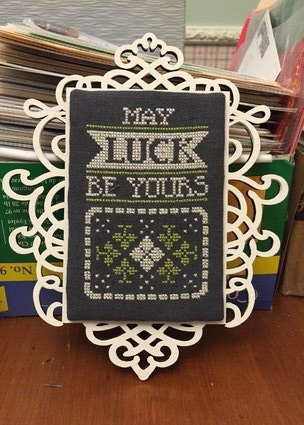 I’d’ve needed to buy another if I’d stitched the clovers in white. Stitched on 30-ct. Gunmetal linen by Weeks Dye Works as recommended, using recommended colors. Changes: Stitched clovers in Avocado and diamonds in Chalk instead of the reverse. Happy Pi Day! I stitched a little pincushion for the occasion. At 9:26:53, it will be/was an auspicious Pi Day, indeed, if you write your dates in the American fashion. It will be 3/14/15, 9:26:53, the first ten digits of pi. Fun! Where’s the confetti? 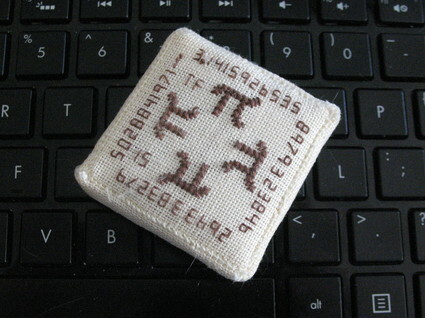 This is Pi, er, Squared, a freebie by Tor-Rhuann Designs, which you can download here. In case you need your math refreshed, pi x r squared is how you find the area of a circle, with “r” representing the circle’s radius. I call mine Cocoa Bean and Cherry Cobbler, um, “Pi, er, Squared,” because those were the names of the Classic Colorworks floss I used. Yes, their names did influence my choices. 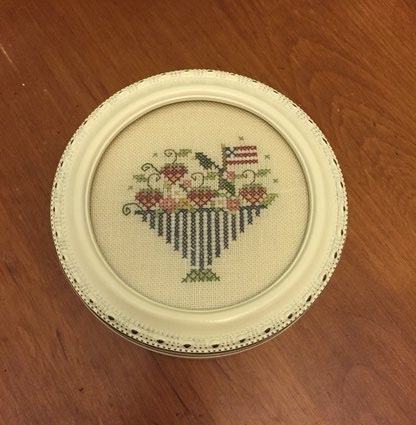 I enjoyed stitching this so much. Also, Sir Cumference has asked me to remind you that you can determine the circumference of a circle by getting “pied,” that is, multiplying the diameter times pi. Here’s the bottom, with some Cocoa Bean pis. I’m going into pun timeout now. 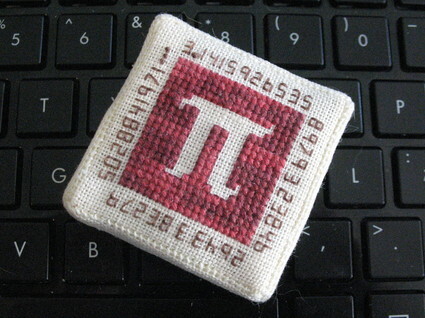 Pi, er, Squared by Tor-Rhuann Designs. 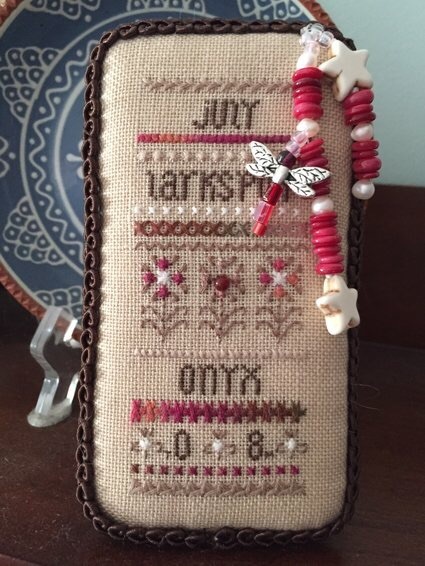 Threads used: Classic Colorworks Cocoa Bean and Cherry Cobbler.